We want to provide a strategy for adults and kids to pray at elementary schools. This day is designed to complement the prayer strategy of See You At the Pole (SYATP). Many parents have expressed concern about their elementary age children being at school early to participate in SYATP without adult supervision (Many schools will not allow adults on campus to participate in SYATP). See You At the Playground is designed to provide an alternative for those situations and is NOT designed to replace SYATP. You may host SYATPlayground on ANY date you choose! 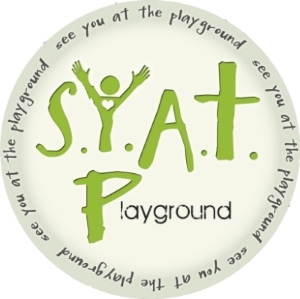 Any local church can serve as a sponsor for SYATPlayground in their community. Designate one person to serve as the local coordinator. Invite other churches to participate. Determine elementary schools where you will meet to pray. Assign a group to pray at each elementary school in the area, and designate a leader for each group. If your prayer group is small you may want to have the same group go to multiple schools. Determine if you want the people who are going to pray to meet at the school or the local church. Most schools do not have restrictions on people being on campus after school hours, but you will want to notify the principal at each school to inform them of your plans. You could send a note or letter that says something like, "In show of support for the elementary schools in our community, we will have a few people on campus (give specific date) around 10:00 AM for a brief prayer time." Specific Location: The school playground. Please note that some schools lock up the playground on the weekend. In those cases an alternate location on the campus should be chosen. Another alternative would be to check with the school officials about getting someone to unlock the playground area. Be willing to pay the school maintenance personnel for their time to come to the school on a Saturday. Contact other churches in your community to invite them to participate. Put the event on the church calendar of each church participating. Utilize social media, church newsletters, and pulpit announcements to promote the event for several Sundays prior to SYATPlayground. Announce the event in children's church for several Sundays. With permission, promote the event on the school calendar, with PTA or other organizations, and place announcements in the teachers' boxes or break room. The designated leader should express thanks for everyone coming and let them know the purpose of the gathering. Sing a popular worship song. Pray: You may want to have a couple people designated to lead in prayer. Also encourage others to lead in prayer. Depending on the makeup of your group, corporate prayer is also an option. Pray for the principal, teachers, workers, and students. You may choose to distribute the Campus Prayer Guide to participants. Keep it Fun: Remember there will be kids present, so do some things to encourage their involvement! Have some children lead in prayer for each grade, or for each of the different groups at school (students, teachers, etc). Have the leader of the group dismiss. Encourage the people to pray for the schools on a regular basis using the resources on this site.